Any other I missed? Let me know here. Want to download episodes directly rather than subscribe? Ramit Sethi – don’t be put off by his spammy sounding page as there’s lots of good advice and you’re likely going to find something that fits you in one of his blog entries. Corrina Gordon-Barnes – In a very engaging chat, Corrina at one point mentions someone from her past: “He thought he couldn’t have both passion and money, and he chose money.” Her EOF interview page also links to an interesting article about blogging. I’ve found that it is rare that a podcast has all this. And interestingly I haven’t found one that ticks all 5. The reason it is so difficult to get all five is having consistent volume all through out different episodes, and usually episodes go through a bit of an evolution (audio particularly would change). I’ve arranged my list according to how essential they are in my decision to download episodes more from that podcast. Nothing will trump this, even if the Podcast ticks the other four requirements. If the content of the Podcast doesn’t resonate with me — I’m not going to keep on listening to it. I’ve also stopped listening to a Podcast whenever there is anything demeaning/condescending/arrogant said by either the hosts or guests. I’m quite okay with mobile phone quality, as long as the levels are okay. There’s nothing more frustrating than to get to the part that I am quite engaged in, then having that section cut (or fade) out. I would be cool with (if it was on video) subtitles or transcripts, to make up for the not-so-good audio. Episode introduction (music or narration) significantly louder than the rest of the episode. Whenever I find something useful to share, I do. And it is better to not have to worry about making a note to the person I’m recommending the podcast to “make sure headphones are on, and only for private listening”. Interested in hearing my take on your podcast? More than happy to! That could be what I walked away with..but it wasn’t. Because my previous impressions of both have been favourable, and I was able to dismiss this (likely wrong!) thought. I first came across Ann when she responded to a post mentioning her (it was one of those lists about marketing — and I would have liked to share it with you, as you would have probably wanted her to be your ‘bestie’ after reading her brilliant response). Which led me to check out her blog posts…find one that was an interesting read…then tweet about it. Of course, Ann being the awesome person that she is (taking time to respond to mentions and comments) — thanked me. 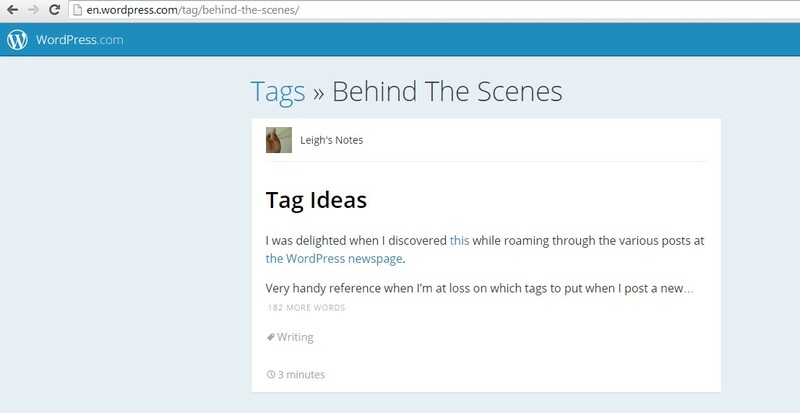 I was delighted when I discovered this while roaming through the various posts at the WordPress newspage. Very handy reference when I’m at loss on which tags to put when I post a new Q&A. Going further than that, I started to look at the entries for each tag, and found that it could be also another way that I could find things that are interesting. Though a number of these tags do end up with spam-like entries, I’ve found some tags that are worth looking at. Of course there are still some entries that look a bit left field and (yikes!) spammy. That’s okay though, just like with Twitter trending Hashtags — spammers hijack them too. I previously attempted to find new entries to read via the WordPress search function, and after that experience. Never again! Really glad I found the tag search. One note though, if you are tagging any of your posts. There are times that the posts do not get picked up right away. Interestingly the ‘blogging’ tag didn’t pick up the entry, and I’m guessing it might happen after half an hour or so (as this was the case for one of the Q&A entries: it took about half an hour to show up on a particular tag’s feed). I used to think that there was someone vetting what comes up on each tag’s feed — and was quite disapointed when an entry wasn’t featured. Now I understand, that for some (tags) it just takes time. Am curious to know the story behind how you came to choose yours. Since the content is still sparse, I’m thinking I should add more? Interestingly, I’m reminded of the storage limit of each basic blog (3 Gig) after going through the tick boxes. Tempted to ask other bloggers what they are now at with storage.